Wolves don’t live in a world unto themselves. They, like all species, exist in an interactive and pulsating place, one that is increasingly influenced by humans and their influence. Good or bad, a significant part of human influence has to do with finances. Money talks, and it speaks both for and against wolves, depending on the source. We hear a lot about prominent groups that use their wealth to kill wolves. But Ted Turner, who has a net worth of 2.2 billion and owns over 2 million acres of land, is using his money to help them. I learned about Turner’s far-reaching philanthropy last evening at Southern Oregon University in Ashland. The lecture I attended was the first in a Pacific Northwest tour entitled, “Two Talking Wolves” featuring writer Todd Wilkinson, who just released the paperback version of his book, Last Stand, Ted Turner’s Quest to Save a Troubled Planet, along with long-time environmental advocate and Cascadia Wildlands executive director, Bob Ferris. The Ashland talk, as well as the one tonight in Roseburg, includes Mike Finley, who, among dozens of other attributes, was supervisor of Yellowstone National Park when wolves were relocated there in 1995 and 1996. Capitalism, as demonstrated by Ted Turner, has tremendous potential to reduce the damage done to the environment and its inhabitants. Turner’s vast Flying D ranch near Bozeman, Montana is home to 5,000 bison, a ton of elk, as well as the Beartrap pack, one of the largest groups of wolves in the country. The Beartrap is one lucky pack. Turner doesn’t shoot them when they ingest his resident ungulates. He wants them there, because he likes wolves and also because when wolves dispersed from Yellowstone to the Flying D, Turner achieved the rare distinction of owning land with biological wholeness, a place with an intact collection of native creatures. He’s even rewilding prairie dogs, with a quarter of a million of the little rodents tunneling away so far. The cascade effect is in action here; black footed ferrets, our most endangered mammal, find homes in the prairie dog tunnels. Turner’s resources serve a multitude of organizations, as we learned from Mike Finley, president and treasurer of the Turner Foundation. Finley calls foundations “change agents,” as they have a way of getting things done that the government is unable to. The best way to gain an appreciation for the generosity of this foundation is to check out the appendix in the back of Willkinson’s book. There are seventeen pages, each page with three columns (and the print is small) listing the organizations that received money from the Turner Foundation up until September 13, 2012. The total giving was $385 million. The groups benefiting range from the Montana Zoo to the Alzheimer’s Association, from the China Women’s Hotline to the Wildlife Society. The organizations are as diverse as is imaginable. No one can accuse Turner or his foundation of being narrow minded in their choice of beneficiaries. If you live near Roseburg, Oregon don’t miss the chance tonight to hear Mike Finley’s part of the conversation. Finley is well known for his proactive work in the National Park System. In 1988, as superintendent of Everglades National Park, he pushed for a law suit against sugar cane growers to stop their pollution of the “River of Grass.” In his position at Yosemite, Finley limited the number of visitors allowed in the valley to prevent harmful overcrowding. And at Yellowstone, he used the same determined approach to help bring wolves back to the park. Finley currently serves on the Oregon Fish and Wildlife Commission where last week, he stood up against the proposal to increase the spring bear hunt in southern Oregon. He is also a graduate of Southern Oregon University. 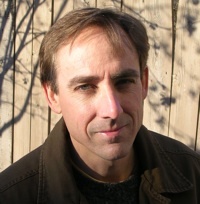 Wilkinson has been a journalist and writer for over twenty-five years. His 1998 book, Science Under Seige: The Politicians War on Nature and Truth, sheds light on how the government puts politics in front of truth, often ignoring evidence discovered by their own scientists. He spent seven years on the biography of Ted Turner and his book is filled with revealing interviews, showing us a side of Turner that is rarely made public. One of the most enjoyable aspects of “Two Talking Wolves” is hearing of the camaraderie between the presenters. Wolf advocacy goes back a long way and when Finley was in Yellowstone working toward the return of wolves, Bob Ferris was in Washington D.C., speaking for Defenders of Wildlife on the reasons why wolves should live in the park. He admitted that he had to testify that yes, of course all the wolves could be rounded up if need be after their release. After all, they all wore telemetry collars. I envision his fingers crossed behind his back, knowing how difficult this task would actually be. Ferris was also part of the team that went to Ft. St. John B.C. 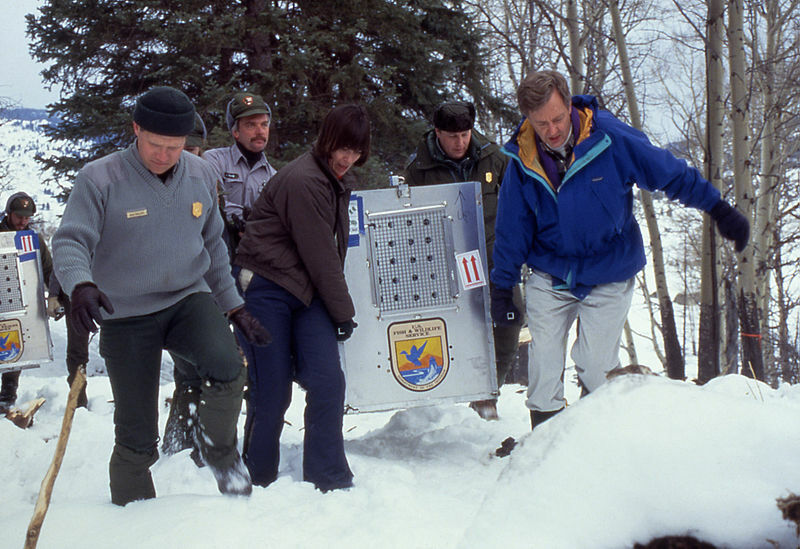 to capture wolves for the Yellowstone and central Idaho reintroduction. He has a keen interest in what goes on in the human mind regarding wolves, believing that understanding the root cause behind the war against wolves is essential to solving the problem. Ferris and Wilkinson met each other years ago while working on a swift fox project on the Blackfoot reservation in Browning, Montana. They hit it off, no surprise, and have maintained a friendship ever since. Ferris also talked about OR 7 and his mate, Wandering Wanda, the name he coined for the female black wolf. He pointed out that Wanda has a story as fascinating as Journey’s but she isn’t getting the same attention. Ferris predicted years ago that wolves would return to his home state of California. Journey, and perhaps Wanda as well, have made this come true. And no doubt their pups will disperse into the Golden State sometime soon. Between the efforts of Wilkinson, Ferris and Finley, there are decades of work toward creating a saner, safer world for wildlife as well as for human beings. 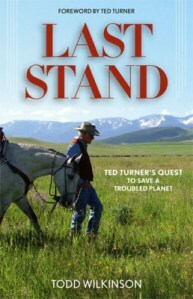 And Ted Turner adds his own style of environmentalism to the mix, one that throws in the benefit of his assets. While it’s easy to become discouraged about the problems we face in defending wolves, something Bob Ferris said comes to mind. “If we are frustrated by the lack of progress, it doesn’t mean that people aren’t working hard behind the scenes.” Two Talking Wolves” provides proof of this. Be sure and attend if you can. Visit Cascadia Wildlands website. Details of the upcoming talks are below. If you have suggestions about venues we should investigate or people we should contact along this general pathway, we would be most appreciative. We are also flexible in terms of presentation format and audiences. Carolyn Candela at Cascadia Wildlands will be helping with logistics on this tour, but please feel free to contact any of us about opportunities or interest (bob[at]cascwild.org), (tawilk[at]aol.com) or (Carolyn[at]cascwild.org). This entry was posted in grey wolf, Uncategorized and tagged Bob Ferris, Cascadia Wildlands, grey wolf, Last Stand, Mike Finley, OR 7, Todd Wilkinson, Yellowstone. Bookmark the permalink. Thank you for writing this! Huge! And thank you, Barbara, for reading! Nice write-up Beckie! We’re really looking forward to our event here in Corvallis this Saturday evening. Thanks, Pam and Randy. I’m sure you will enjoy the talk!